Casa Dos Rios is our much-loved, wild, and wonderful piece of land at the foot of Mt Madonna in the Santa Cruz Mountains near Gilroy, California. The feelings I have for the land grow deeper with each new experience. While it goes without saying that the land will outlive me, I constantly strive to better the care I give to it, trying to out-think my prior plans, trying to out-learn my prior understandings, trying to out-see what I missed in hundreds of walks around the property. After years in Silicon Valley, we hankered for quieter country surroundings. 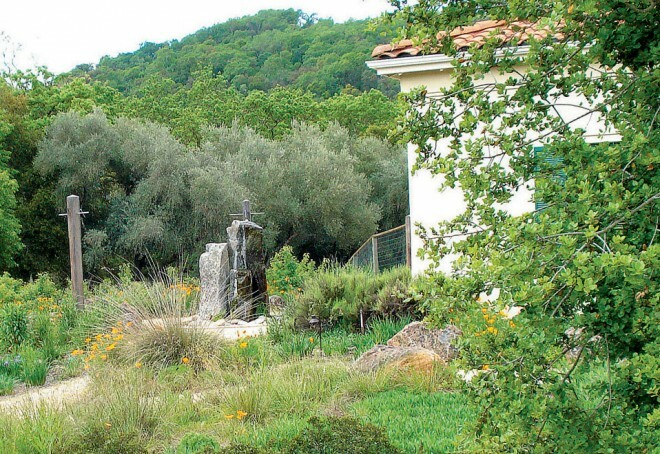 We found Casa Dos Rios in 2004 and spent the next three years remodeling the house and installing a semiformal California Native Wildlife Garden—a garden whose purpose is to serve wildlife. Casa Dos Rios encompasses approximately fourteen acres, about half of which is riparian corridor and half is vineyard and a house. Two creeks merge on the property, creating a flood plain during heavy storms. The first is Uvas Creek, which is dammed just north of us and is managed to run year-round by the Santa Clara County Water District, to support young steelhead that breed in the creeks and to replenish the local aquifers. The second creek is Little Arthur, which empties the eastern side of Mt Madonna. Little Arthur is prone to flooding and has been known to rise ten feet after a heavy storm. The elevation here is approximately three hundred feet above sea level. We get morning fog and sea breezes many days of the year. When the breezes stop in August, temperatures can rise to 119°F; winter freezes drop as low as 19°F—a 100° swing. Without the necessary habitat, a hungry bird may starve, suffer from extreme temperatures, or fall victim to predation. 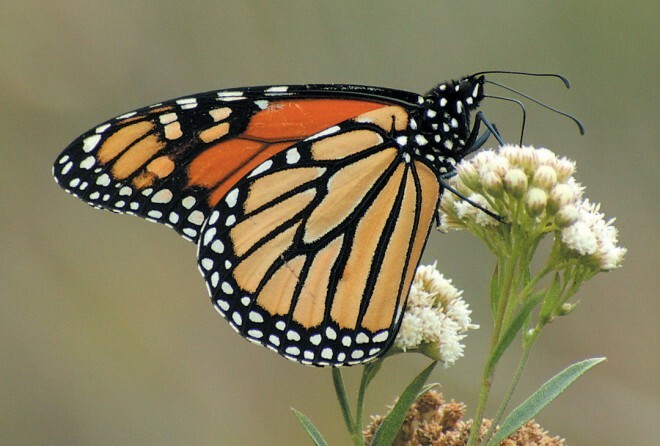 The loss of habitat has led to a severe population decline for many species and an overall reduction in the total number of bird species, not to mention other kinds of both flora and fauna. 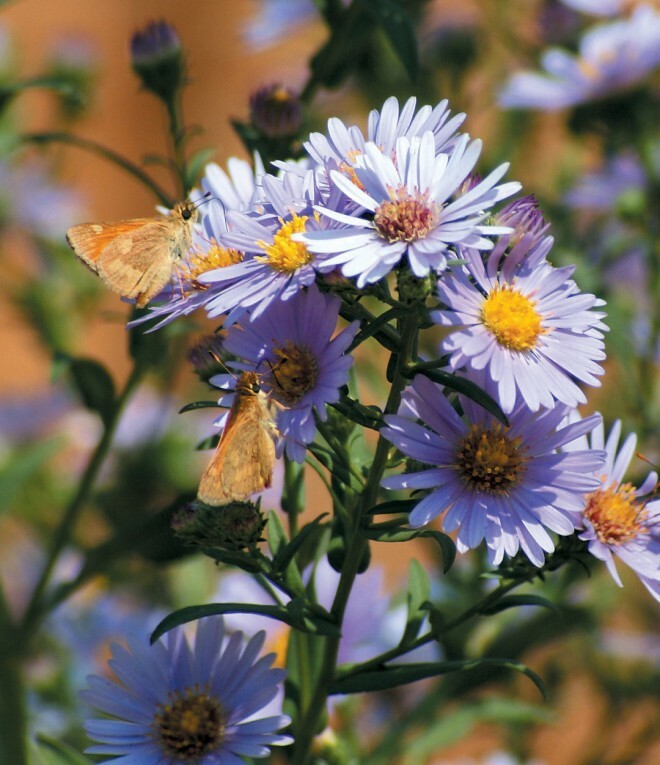 Creating and maintaining habitat became the impetus for our native garden. The garden was installed by Modern Landscaping, Inc of San Jose. Land was shifted, materials were removed (mostly reused or given away). 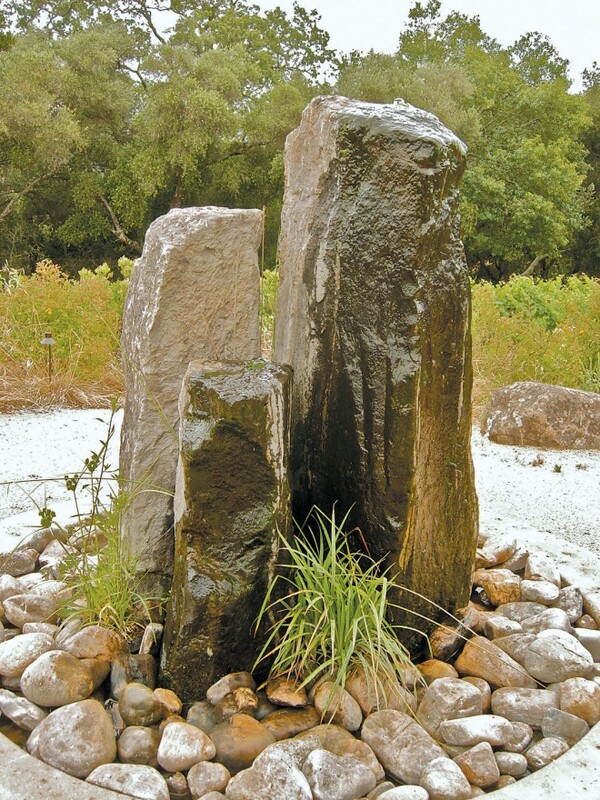 Cranes were used to install rocks from Northern California that weighed up to 23,000 pounds, and to plant sixteen thirty-six-inch boxed coast live oak (Quercus agrifolia) and valley oak (Q. lobata). Concrete patios were poured, stone walls built, and the swimming pool partially filled in (to use less water) and refinished in a subtle pebble-sheen finish (to better blend with the natural surroundings). Basalt columns were placed for the Frog Fountain and used as garden art. Netafim drip irrigation was plumbed and lighting and electrical wires laid. Soil was amended, and almost six thousand plants were planted and mulched. 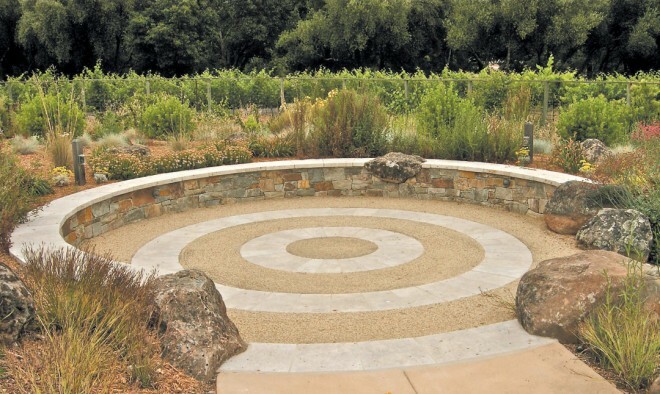 Lastly, decomposed granite (DG) paths were given a final finish, and lighting was installed Pots were placed on the patios with selfcontained water and drain systems. A private patio, with limestone fireplace and barbecue, was completed. Additional art was installed, and, by June 2007, the initial garden was complete. Then my work began in earnest. During the first year, the wildlife came. 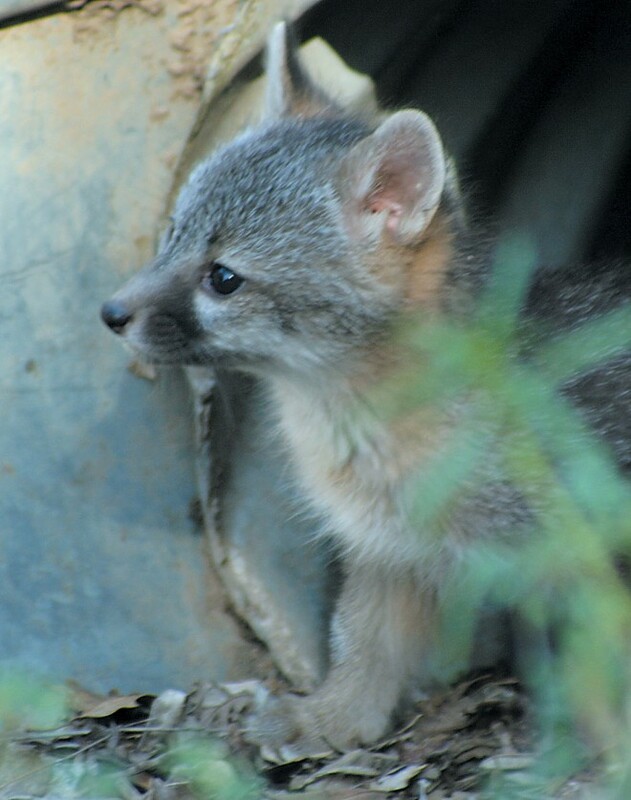 The first signs were the little dugouts under the fences into the house garden, signifying an invasion by a family of gray foxes (Urocyon cinereo-argenteus). We left the dugouts that were in places that wouldn’t trip a human visitor. As the many colored varieties of common yarrow (Achillea millifolium) burst into sweeps of bloom, the juvenile foxes romped and rolled amongst them, breaking the stems to the ground. Amazingly, the beds looked passable after removing the broken blooms and, while never as pretty as the untouched beds, made for fond memories and great storytelling. We can always count on the black-tailed jackrabbits (Lepus californicus) to amuse us. These simple creatures are usually present at dusk and dawn, feeding in the vineyard, or hopping wildly away from our headlights when we come home at night. After the first year, some of the new plants had put on substantial growth; coast sagebrush (Artemesia californica), California rose (Rosa californica), and toyon (Heteromeles arbutifolia) now form small thickets that provide cover for the jackrabbits. The popular California quail (Callipepla californica) prefer dense stands of shrubs with openings large enough for their chubby little bodies; here, they are fond of Vine Hill manzanita (Arctostaphylos densiflora ‘Howard McMinn’), big saltbush (Atriplex lentiformis), ninebark (Physocarpus capitatus), and the upright forms of snowberry (Symphoricarpos). They raise their young in a large stand of snowberry in the riparian corridor. They also like redwood trees (Sequoia sempervirens), where I’ve found them huddled for warmth and shelter during the winter. Quail need perches from which a male can keep a lookout for danger while the flock feeds; in nature, they like to use the upper branches of fallen trees. Hummingbirds are another favorite. Anna’s hummingbirds (Calypte anna) were a migratory visitor to Casa Dos Rios when we first bought the property. Only after we installed the Native Wildlife Garden did they decide to stay year-round. In spring, they feed on foothill penstemons (Penstemon heterophyllus ‘Blue Springs’ and ‘Margarita BOP’) and Douglas iris. In summer, there are wildflowers planted from seed, and, in the fall, the hummers vigorously fight over patches of California fuchsia (Epilobium canum). 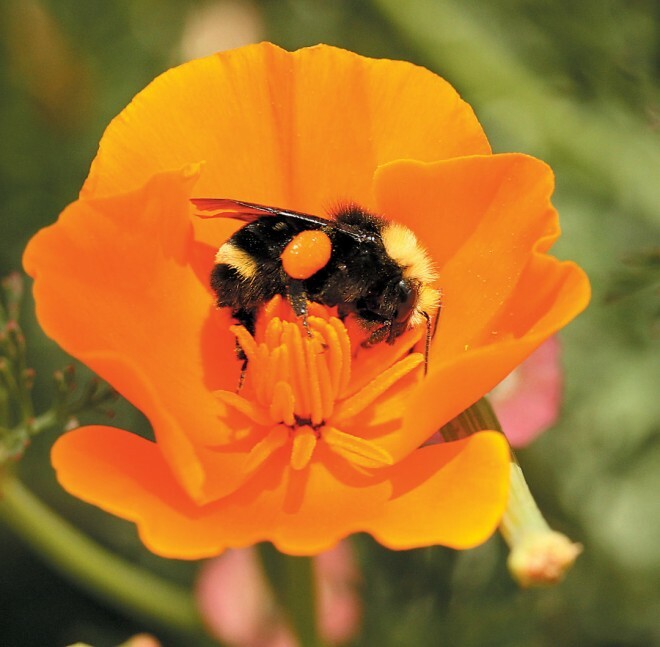 They enjoy the blooms of coast twinberry (Lonicera involucrata) and California poppy (Eschscholzia californica) nearly yearround and, during breeding season, glean insects to provide protein for their young. I take special pleasure in watching them lie down in the water on top of the fountain, vibrating wings and feathers to allow the water access. They repeat this ritual many times a day during the hot summer and are usually found at a perch near the Frog Fountain when not bathing. A favorite seasonal visitor to our garden is the wild turkey (Meleagris gallopavo), foraging here in numbers as high as fifty at a time. These birds are grubbers, scraping the mulch away looking for grubs, worms, and other small edibles they can find in the upper soil layers. After the flock has departed, most plants have a nicely cleared area around their bases. (I once paid our gardener to do the same thing, but he left no “fertilizer pellets” behind.) I’m always happy when the turkeys come to visit. They keep the mulch away from the stems and trunks, and I get to admire their striking feathers and lumbering flight. While pruning the toyon hedge along the road last fall, I found a nest filled with lesser goldfinch (Carduelis psaltria) chicks, waiting expectantly with bobbing heads for a parent to return. I stopped all pruning immediately and vowed never to prune again until January, when all nesting birds should have fledged. Toyon is one of my favorite wildlife shrubs. Not only does it look great all year, with its glossy leaves and thick upright habit, but it provides loads of red berries that feed the birds in the lean winter months. Swallows also nest at Casa Dos Rios and eat many of the insect pests. 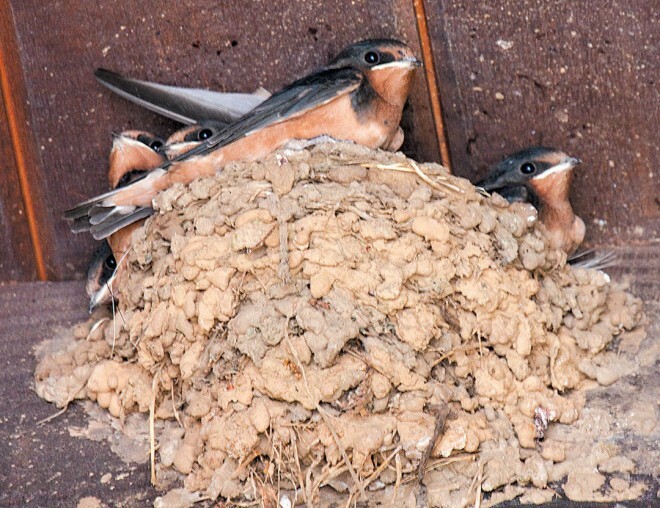 These messy regulars stay from March to July: barn swallows (Hirundo rustica) and cliff swallows (Petrochiledon fulva)) building nests under the eaves, while tree swallows (Tachycineta bicolor) inhabit the nest boxes we provide. The swallows (and other birds) eat flies, yellow jackets, and other annoying insects that usually make al fresco dining unpleasant in suburbia. The runoff from the nearby pond creates mud for swallow nest building; the proliferation of insects in the country provides a constant source of food. The mess they leave beneath their nests is substantial, but the payoff in natural pest control and our delight in watching them swoop and soar over the garden is priceless. When we purchased the property, I noticed Pacific tree frogs (Hyla regilla) and Western toads in the swimming pool. During that first breeding season, the pool was alive with adult frogs and thousands of pollywogs. As time passed, both the adults and the pollywogs died from the chlorine in the pool (the steep edges prevented the adults from climbing out). I felt I owed it to the frogs to create a better habitat for them, so I designed a fountain that would meet the needs of both amphibian and avian friends. I wanted the fountain to offer cool water during the hottest summer weather, and to stay clean without the use of dangerous chemicals. The pool is three and one-half feet deep and filled with a cross-hatch of large stone rectangles (left-over materials from earlier construction projects), much like a log cabin, to keep much of the water out of the sun’s warming rays. An ultraviolet system controls green algae and a bio-filtration unit removes particulate matter. The edge of the pool is covered with attractive stone cobbles to further reduce the impact of direct sunlight on the water, thus lowering temperatures and reducing algae production. 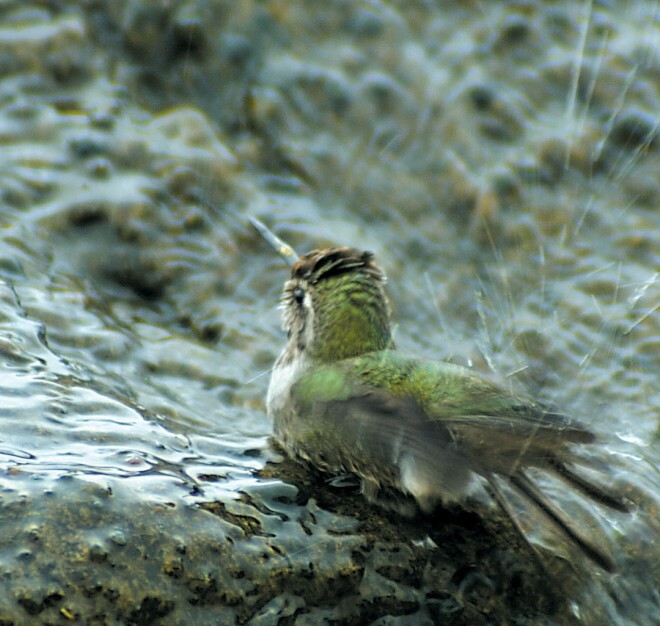 Basalt columns were core-drilled, allowing a regular flow of water to emit from their tops; the result is a fantastic birdbath that runs from 7 am to 10 pm each day. Maintenance of the Frog Fountain consists of a regular scrubbing of the exposed basalt columns to keep green algae to a minimum. Periodic cleaning of the filtration unit is also necessary. Black algae will be introduced by the frogs over time; this will require emptying, cleaning, and refilling of the fountain every five years or so. As soon as the fountain was filled, mosquitoes found the water. I used mosquito dunks during the first year, but never quite won the battle. As the frogs moved in, the mosquito larvae disappeared. Now, a chorus of frogs loudly proclaims the success of the Frog Fountain. 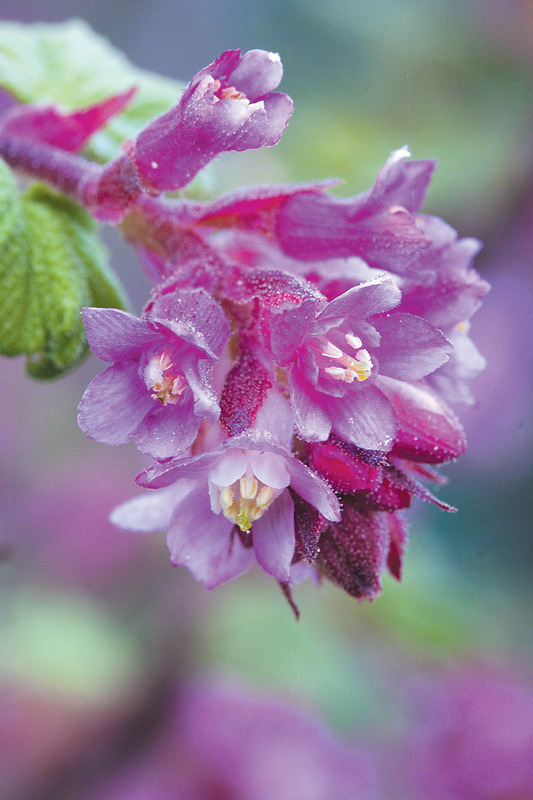 An unexpected joy of our Native Wildlife Garden has been the plants introduced by birds. I never know what I’ll find next. A gift from our bird friends is dotseed or foothill plantain (Plantago erecta). One of these cute little plants, with spikes of tiny white, burgundy centered flowers, volunteered in the DG around the Frog Fountain in 2008. I covered it with a mason jar so the gardener would not pull it, and it stayed that way through the 2008 Going Native Garden Tour; like a proud mother, I showed it off to anyone I could snare. Shortly after the show, the gardener pulled it. I crumpled with grief. This past spring, however, there were over two dozen dotseeds in the DG around the Frog Fountain, and the gardener has agreed not to touch that area again. Few plants can surpass oaks for superlative wildlife value. They provide acorns for deer and birds, insect habitat for feeding warblers and other small birds, shelter against predation, nest sites for raptors, owls, woodpeckers, and other cavity-lovers, and a broad canopy under which shade-loving plants thrive. I favor the coast live and valley oaks. After planting the boxed specimens early on, I have learned that it is always prudent to plant oak trees from acorns; the seedling roots can travel straight down, instead of developing a corkscrew pattern seen in containerized trees, which may eventually weaken the trees and cause them to topple in a strong wind. As our Native Wildlife Garden matures, and I learn better how the wildlife we support interacts with the garden, I modify my gardening practices to reflect this knowledge. Hopefully, through this process, I will be able to pass my enthusiasm and knowledge on to others who will implement a form of wildlife gardening on their own properties. Now is the time in Earth’s history for people to prove that they care enough to make the changes necessary to support and protect all of Earth’s creatures, not just its human inhabitants. I hope you will join me in thinking about the wildlife values of the plants you choose for your garden. You’ll be rewarded beyond belief.